The event which took place at Toyota Ireland HQ, saw 20 of the best motoring technicians in the Toyota Ireland network compete for the coveted award. Conor Bowen from Lehane Motors was named Technician of the Year 2018 at Toyota Ireland’s National Technical Contest. The event which took place at Toyota Ireland HQ, saw 20 of the best motoring technicians in the Toyota Ireland network compete for the coveted award. The first stage of the contest involved an online aptitude assessment and practical skills assessment. Following this, five technicians were shortlisted for Technician of the Year. The final element of the contest was for each candidate to participate in a series of timed technical exercises, designed to challenge ability and test stamina while under pressure. Martin Kinsella, Johnny Abel, Michael Oporowicz, Owen Kavanagh and Helen Martin of Toyota, had the difficult task of judging the candidates on their problem-solving skills and ability. 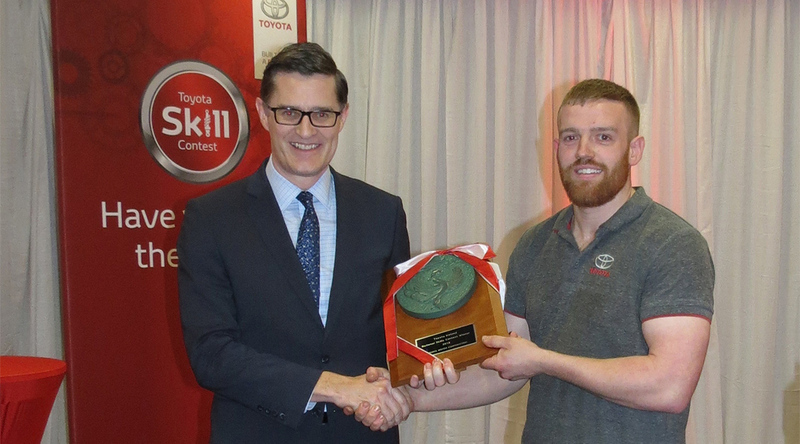 It was with great pride and in honour of outstanding performance during the Toyota Ireland Skills Contest that Conor Bowen was announced as the winner. Toyota Skills Contest entrants from left to right: Joseph Higgins, Toyota Liffey Valley. Michael Quirke, Brian Geary Motors. Terry Hogan, Denis Mahony M50. Conor Bowen [Winner], Lehane Motors. Maciej Kolodziej, Tony Burke Motors. “We’re delighted to host a competition of this nature for our technical employees and it’s a great opportunity to showcase the calibre of work of those working on Toyota vehicles throughout the network. The technician’s skills are tested through an aptitude test followed by a series of practical examinations and it’s clear that standard of this year’s competition was extremely high.